Definition at line 92 of file target.h. Enum to identify a target object through SnmpTarget::get_type() method. It is a SnmpTarget object. It is a CTarget object. It is a Utarget object. Definition at line 99 of file target.h. Create a SnmpTarget object with default values. The validity of the target will be false. Definition at line 110 of file target.h. Create a SnmpTarget object with the given Address. Definition at line 117 of file target.h. Destructor that has nothing to do. Definition at line 125 of file target.h. Reimplemented in UTarget, and CTarget. 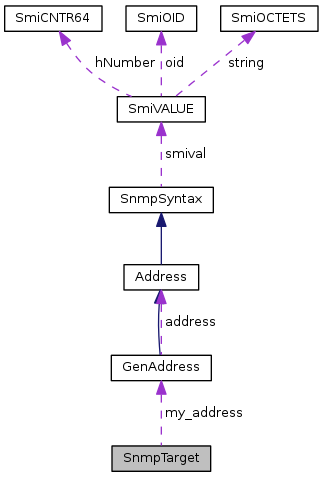 Virtual clone operation for creating a new SnmpTarget from an existing SnmpTarget. A pointer to the new object on success, 0 on failure. address - GenAddress object to store the target address. Definition at line 222 of file target.h. The number of retries on timeout. Definition at line 156 of file target.h. The timeout for requests sent using this target object. Definition at line 173 of file target.h. Return the type of the target object. If a SNMP message is received through a callback (that only passes a SnmpTarget pointer to the callback function), this method can be used to check the type of the object before doing a cast to CTarget or UTarget. Definition at line 135 of file target.h. Get the SNMP version for this target. The SNMP version of this target object. Definition at line 238 of file target.h. Two SnmpTarget objects are considered equal, if all member variables are equal. 1 if targets are equal, 0 if not. address - The address that this target should use. Change the default retries vlaue. Changing the default retries value will only have an effect for target objects that are created after setting this value. Definition at line 194 of file target.h. Changing the default timeout value will only have an effect for target objects that are created after setting this value. Definition at line 183 of file target.h. r - The number of retries if no response is received. Definition at line 149 of file target.h. Set the timeout for requests. The default timeout for requests is 1 second (100). t - Timeout in 10ms, so 100 will set the timeout to 1 second. Definition at line 166 of file target.h. Set the SNMP version of this target. v - The SNMP version that should be used for sending messages. Definition at line 245 of file target.h. Returns the validity of the target object. true, if the target is valid. Definition at line 142 of file target.h. Definition at line 271 of file target.h. Definition at line 270 of file target.h. Definition at line 268 of file target.h. Definition at line 265 of file target.h. Definition at line 264 of file target.h. Definition at line 267 of file target.h. Definition at line 263 of file target.h. Definition at line 266 of file target.h.